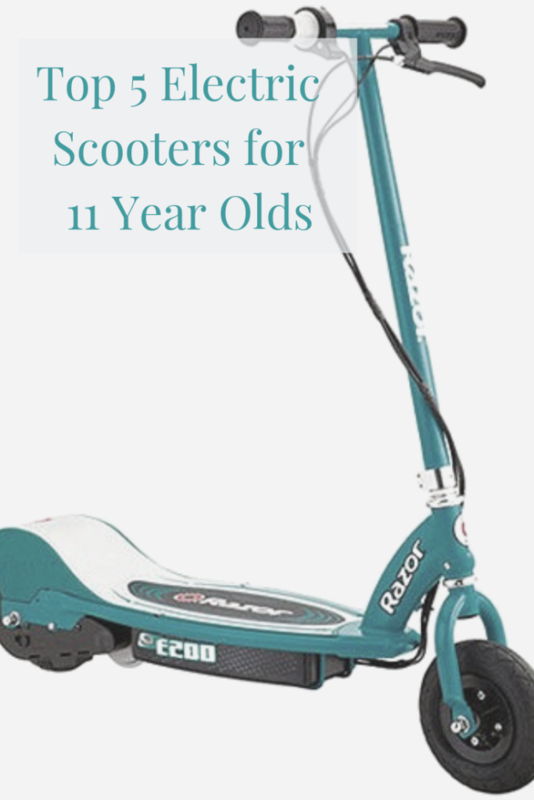 There are numerous electric scooters that are suitable for 11 year olds. The main question you may need to answer before you choose which one is suitable for an 11 year old is how much power and speed do you think they will be able to handle? 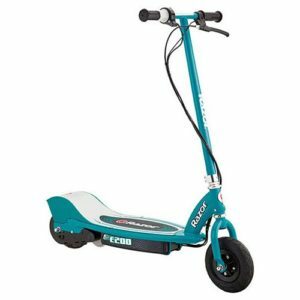 Check out some reviews of scooters below as well as a comparison chart which shows at a glance all the scooters which may be suitable. And scroll to the end for some videos of each scooter in action. The classic E100 scooter has been around since 2003 and has won awards. So one thing you can be sure of is it has stood the test of time. It requires a kick start to start the motor. It has twist grip acceleration on the handlebar. The max speed of the scooter is 10mph. There is one speed on the scooter and no variable acceleration. So it's on (at one speed) or off. It has a run time of 40 minutes on one charge. There is a pnuematic wheel at the front which will add some comfort going over bump and cracks in the pavement. The rear wheel is urethane. There is a weight limit of 54kg. ✔️ Speed - Most electric scooters for kids have one speed of between 6 mph and 15mph. Most 11 year olds will be fine with 10mph. It's not too slow or too fast. Most kids will go this fast on their bike. However, if you have a particular confident child, you may look at a scooter which goes a little quicker than 10mph. These are often aimed at teens but some 11 year olds may have the ability to use them. Of course, it will depend on the child, so it's your call. There are videos at the end of this article where you can see the scooters in action and this may help you make a decision. 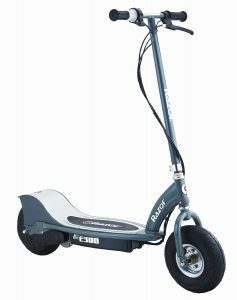 The E200 scooter is a step up from the E100, it goes slighly faster and may be a good choice for an 11 year old who wants an electric scooter with a bit more speed. Unlike the E100 it doesn't require a kick start to get going. Just jump on and off you go. It can reach speeds of up 12mph (although like all electric scooters the actual speed will depend on the height, weight and balance of the child). Like the E100, it has twist grip acceleration control with a hand operated rear brake. It has no variable acceleration and travels at one speed only. One difference from the E100 is that both the front and rear wheel have 8 inch pneumatic tyres for a smooth ride. The frame size is slightly bigger than the E100. It's 105cm high (41.3 inches) from floor to top of the handlebars. It measures 94cm (33 inches) in length. The frame is a good size for the 10 to 13 age group. The Razor E300 has a recommended age limit of 13 plus. However, there are reviews of 11 year olds and much younger children using it. It is quite a bit nipier than the other scooters featured on this page so it really is an adult's call as to whether this will be okay for their 11 year old. One real plus point of this scooter is that it has a front and rear pneumatic tyres so it will offer a smooth ride over bumps and cracks in the path. Unlike all the other scooters featured on this page, the E300 doesn't require a kick start. It has a chain driven motor to reach the scooters 15mph speed. However there is no variable speed which may be a concern. The frame height is 44.5" and the width is 40". This is quite a bit bigger than other scooters on this page. For example, the E100 has a frame size of 36" by 34". The weight limit on this scooter is 100kg. This means that all older kids and teens can enjoy the scooter as well as adults underneath the weight limit too. This scooter has a handlebar which can fold down which makes it easier to store and transport the scooter. ✔️ Weight limit - Electric scooters have different weight limits that vary greatly. For example the E100 has a weight limit of 54kg whereas the E300 has a weight limit of 100kg. This may have an influence on which electric scooter to buy an 11 year old. If there is an elder sibling in the family or adults who may want a go on the scooter it may not be possible on scooters with lower weight limits. Most 11 year olds will be a way of the 54kg weight limit but if you see this scooter as lasting a few years, it may be worth going for a scooter with a higher weight limit as long as they can handle any extra speed and power. 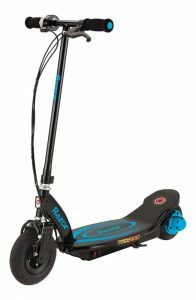 The Homcom scooter has a recommended age from 7 to 14 years with a height adjustable handlebar of 73-91cm. It has a maximum weight of 50kg. The average weight of an 11 year old is just 35.5kg so it should be fine for most kids this age with some growing room too. The scooter has a range of 8 to 10KM with a full charge time of 5 to 8 hours. It features 12km/h maximum speed. (just over 7mph) It's not the fastest scooter which may be fine for some 11 year olds but other kids will want a faster ride. It's equipped with 2 rechargeable 12 V batteries. ✔️ Tyres - You will generally see either urethane / PU wheels and / or pnuematic tyres on electric scooters. Urethane wheels have the advantage that they are puncture proof. However, pnuematic tyres offer more comfort over bumps and cracks in the pavement. They generally give a smoother ride. Pnuematic tyres will be better the older and heavier a child gets. You won't see an electric scooter aimed at adults which has urethane tyres as they will wear down quickly with the extra weight and won't give much comfort on the ride. The Power Core E100 is a newer version of the classic E100. It differs because it has an in hub motor instead of a chain run motor. This means the motor is lower maintenance and quieter. It's maximum speed is 11mph (which is 1mph faster than the E100). It has a continuous run time of 60 minutes which is 50% longer than the E100. ✔️ Frame size - the more powerful scooters do tend to have a slightly bigger frame as they are designed for teens and adults. So, if you have a small 11 year old, a smaller size frame may be better for them. Although there are reviews of young children using the bigger frame sizes and getting on fine. Frame Height 36" 41.3" 44.5" 29-36" 33.7"
Frame Length 34" 37" 40" 30" 35"
A good way is to help decide is read some reviews.